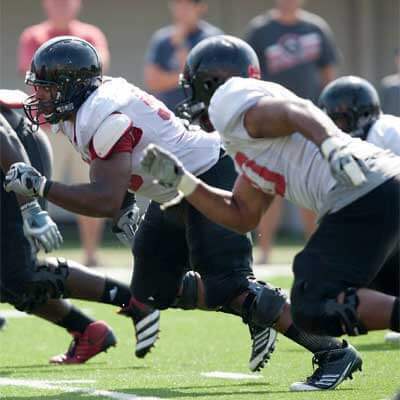 The Northern Illinois football team flashed plenty of big play ability Wednesday at Huskie Stadium, as the offense and defense both had their fair share of highlights. 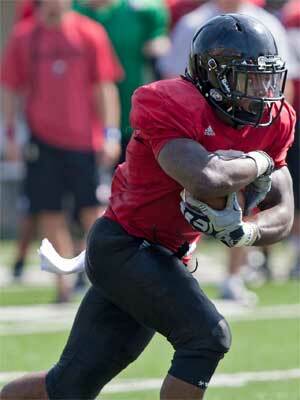 By the end of practice, head coach Dave Doeren had plenty of praise for both sides of the ball. On offense, the running backs and wide receivers stole the show during the team session. In the team rush portion of camp, tailback Giorgio Bowers showed off some smooth moves by eluding several tacklers before diving across the goal line for a touchdown. Later, Leighton Settle found paydirt with a scamper up the middle, while Cameron Stingily fought his way to the end zone for another score. In the first full team session, Jamal Womble delivered the run of the day with a bruising run. After finding daylight around the left side, the senior tailback got into the defensive backfield and plowed over one defensive back – delivering a pop that rang throughout the stadium – before the play was blown dead. The wide receivers also made several big plays on the day. Tommylee Lewis factored heavily into that with two touchdown receptions. The first came when quarterback Jordan Lynch found a streaking Lewis in the middle of the field for a 36-yard score. Later on in the redzone sequence, the sophomore outran the secondary for a 20-yard touchdown that drew cheers from the offense’s sideline. Not to be outshadowed, Jamison Wells showed what he could do as a slot receiver when he snagged a touchdown pass from Lynch in the redzone session. In skeleton, redshirt freshmen Angelo Sebastiano and Juwan Brescacin both hauled in 15-plus yard passes from Matt McIntosh. The offense’s brightest moment, though, arguably came midway through practice. Following a false start, the unit was backed up at their own half-yard line. However, Akeem Daniels sparked the offense with a 15-yard scamper on first down to give the offense some breathing room. After Lynch gained three yards on a rush up the middle, Perez Ashford ended the sequence when he made an acrobatic grab reminiscent of his highlight-reel play in the 2011 MAC Championships along the left sideline for a 22-yard gain and a first down. Yet, the defense was hardly quiet. Nabal Jefferson made his presence known in the team rush session by slicing through the offensive line and registering two tackles for loss on consecutive plays. Another defensive tackle, Anthony Wells, disrupted an option play by knocking over McIntosh just as the ball was being pitched to stop the play in its tracks. The defense continued their strong play in full team. After the offense succeeded in emerging out of the shadow of their own endzone on the first drive, the defense stifled the offense on the next three drives, forcing three and outs on each drive. Capping it off was a third and one play at the 10, where Daniel Green fought his way through the offensive line and corralled Settle in the backfield for a two-yard loss. The team returns to the practice field at 3:15 p.m. Thursday, Aug. 16, before having another two-a-day practice Friday, Aug. 17.